Home Health Care allows patients to have personalized care according to their needs in the comfort of their home. It saves a lot of efforts and time that make the patient less stressed out. Recovering at home is better than in hospitals because patients are comfortable in their homes that provide a healthy environment. Patients can still enjoy quality time with their loved ones. Family presence helps a lot in fast recoveries specially when the patient knows about the full support of the family. In addition, families of the patients are assured that their loved ones are taken care of professionally and they can easily monitor the progress. 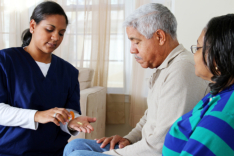 Home Health Care provides easy access to visiting the patient family and friends. Home Health Care provide safety and reduces hospitalizations. Star & Believe Home Health Care provides all these benefits to both the patients and the family members. With Star & Believe Home Health Care you will never have to worry because you know that we care as you care. For more information about our quality services, you can reach us through our Contact Us form.